AS A PROSPECTIVE LANDLORD IT IS IMPORTANT YOU APPOINT THE RIGHT AGENT. 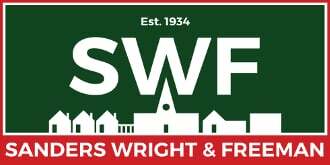 SANDERS, WRIGHT & FREEMAN IS LICENSED AND GOVERNED BY THE ASSOCIATION OF RESIDENTIAL LETTINGS AGENTS (ARLA) AND COMPLIES FULLY WITH THEIR CODES OF PRACTICE. A good agent will be able to provide you with advice regarding the presentation of your property, discuss recent lettings of similar properties and the requirements of prospective tenants currently looking for property to rent, all with the aim of securing a letting to a suitable tenant at a good rental. We will arrange for photographs of your property to be produced and upload the particulars to property websites as well as our own. All of our prospective tenants are registered on our computer database, so we are able to immediately notify them of new properties and price changes. We offer a Landlord Income Protection Scheme. The lettings industry is regulated by significant legislation protecting both landlords and tenants. We are fully up to date with all legal requirements. Before placing the property on the market, an Energy Performance Certificate must be produced. A gas safety inspection must be carried out annually by a Gas Safe qualified engineer on all gas appliances, installations and pipes and is required before the start of any tenancy. This is not required by law but it is the landlord's responsibility to make sure all wiring and electrical appliances are safe. For properties that we manage we will organise a Periodic Inspection Report (PIR) to be carried out on behalf of our landlords. For all properties let (not managed) we recommend the minimum test carried out is a Portable Appliance Test (PAT) for appliances. We will work with our landlords to check that all soft furnishings are carrying the necessary fire safety labels. If these are not present we will advise that the furniture is replaced. It is important that an inventory is produced to record the condition of a property prior to a tenant moving in, particularly now that there is a requirement to register the deposit with a deposit protection scheme. The report will include photographs as evidence of condition if required. You will need to check if you are required to obtain consent to let your property from your freeholder if you have a lease, or your mortgage company if there is a mortgage on the property. Income from the letting of property in the UK is subject to UK Income Tax. As a landlord you will be taxed on the rental income and by appointing an accountant you can offset some expenses, such as agent's fees and mortgage interest, in order to minimise your tax bill. For overseas landlords the Inland Revenue will require you to apply for a Certificate to enable rent payments to be transferred to you without a tax reserve being held by the agent. Many of our landlords choose to appoint us to manage their properties. This means our team will be responsible for the day to day management of your property, to include repairs and utilities as well as dealing with the deposit at the end of the tenancy. We will also arrange regular periodic inspections to check your tenant is taking good care of the property and address any maintenance problems before they become serious issues. Ensure the exterior, as well as the interior of the building is in good order and repair. The interior of the property should be painted in neutral colours throughout and where possible, wood floors are generally preferred in the main living areas. Between tenancies touch up the paint work and carry out minor repairs prior to remarketing. Check that grouting and sealants in the bathrooms and kitchens are in good repair; if minor works are addressed early, more major problems can be prevented in the future. Test the appliances are clean and in working order, ensure instruction manuals are kept in a folder in the property, to include clear instructions on the heating system. All light bulbs should be working and additional lighting is provided for winter viewings. When cold, keep the heating on to give a warm welcome. Professional cleaning of the property after each tenancy is essential and should include carpets, blinds, curtains, soft furnishings and windows inside and out. Keeping the property spotlessly clean is important when the property is vacant and viewings are taking place. For furnished properties ensure the beds are made up with freshly pressed white linen and remove surplus ornaments etc from surfaces. Keep the common parts tidy by collecting junk mail and removing rubbish. Landlords' items to be removed prior to the start of a tenancy should be labelled so these are evident when a viewing takes place.